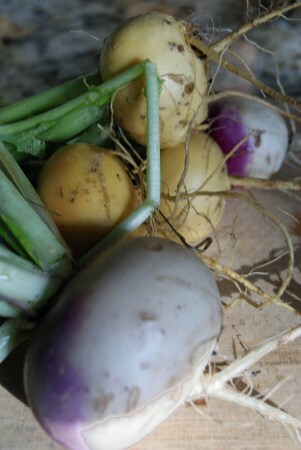 I know turnips usually aren’t very high on most people’s list of favorite vegetables. Honestly, they’re not in my top ten either. They’re basically overgrown radishes, and can be pretty spicy when raw, and mildly bitter even when cooked. Of course, that didn’t stop me from growing them for the first time this year, as I need variety, and I’m always tweaking my lineup to see what does and doesn’t do well here, and what I can count on for storage during the lean months. I planted both the standard purple top and also a variety called ‘Golden Ball’ – that’s as accurate and no-frills a description as you can get. I sow them the same time radishes go out, which was mid-March this year. They both grew at about the same rate, though some of the purple tops got a bit bigger. The Golden Ball seem to be a little more round than the purple top, which are slightly flatter, but there was no distinguishable difference flavor-wise. I suppose if I were really interested in a comparison, I’d cook them separately, but I don’t care that much. For this preparation, I kept it very simple (isn’t that usually the case?). Cube them, toss with a little oil, salt, pepper, and some fresh sage, then bake at 350 F for a good 45 minutes or so, depending on how big your cubes are and how soft you want them. 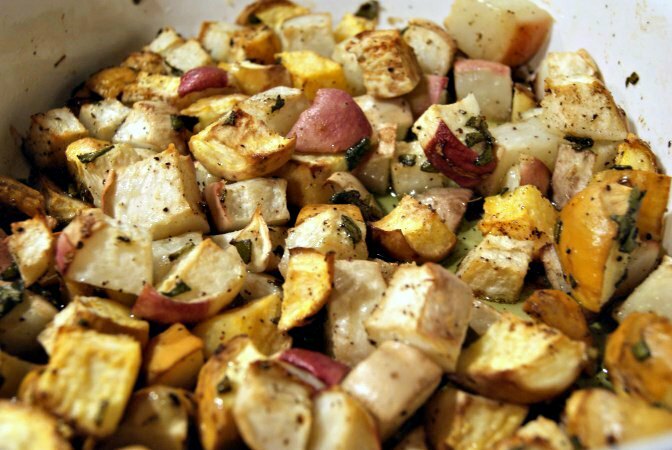 You could also throw in some apples and cinnamon, or squash and maple syrup, but I wasn’t feeling overly fall-ish. Maybe in the fall. And obviously, since we’re picking fresh turnips, that means we have turnip greens too! No sense in wasting those, so I picked out those that were yellowed or too chewed up, then cut up the rest, sautéed them in a bit of bacon fat, then added a little water and simmered for another 30 minutes. Next time I’ll throw in some nice andouille sausage.